Noting the passing of Wangari Maathai, a Kenyan woman who won a Nobel Prize due to her work, in part, with the Green Belt Movement. She was something of an additional celebrity in our house after my wife’s mother gave the boys a wonderful book called Wangari’s Trees of Peace. A brief aside for those who don’t know the family … my mother in law, Catherine Cooke (aka The Venerable), recently retired as the Episcopal archdeacon of Vermont, is a wonderful example of peace and social justice. Her book selections for the boys are always excellent, thoughtful and promote thinking about the best way to live one’s life. 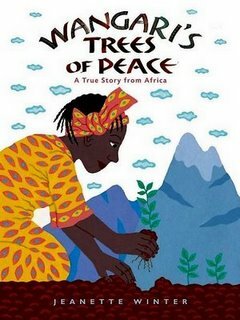 So we read Wangari’s Trees, talked about her efforts to change the world, how it upset the people in power, how the government men came with clubs to put her in prison but how her message spread even then, leading to massive reforestation of fragile lands clear-cut for crops. The boys were rapt. A couple of days later, we came downstairs to find the boys wailing on the living room furniture (and occasionally each other) with wooden sticks from a set of blocks I made them. Previous Post Grade two, or second grade? Next Post Red Sox County?